Today, we have an arsenal of natural fighting tools, designed for prevention and treatment of diabetes whereby reducing or eliminating ones dependency on medication. 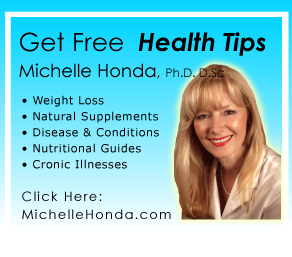 In the following information, Michelle Honda PhD Holistic Doctor gives an overview of some aspects of diabetes and a brief example of her protocol in treating the condition of diabetes. Research abounds, dispelling the myths of predisposition being the soul culprit for type one diabetes. The term predisposition simply means “something else needs to occur.” Conventional medicine and the diabetic organizations, for the most part consider type one to be a genetic disorder. Currently, more than twenty different genetic aspects (genotype) have been implicated as genetic factors that increase a person’s susceptibility to the disease. Genetics can be the most important factor for some; however, this number is only in the range of five to fifteen percent of those with genetic susceptibility for type one diabetics who actually develop it. More research in the area of identifying and assessing risk factors. Dietary and environmental factors are the primary influences that will ultimately determine whether or not, the disease manifests. To reinforce the evidence of other factors; throughout the world over the past forty years, type one diabetes has increased from a three to a tenfold. Our genetic code takes more than one generation to change. Early exposure to cow’s milk and gluten (the protein in grains). Specific viruses known as Enteroviruses and Rotavirus are a common cause especially in children. These viruses and others have an ability to infect pancreatic beta cells by stimulating the immune system to attack the beta cells in an effort to destroy the viruses. The leaky gut syndrome usually results from the rotaviruses and is the main irritant of acute diarrhea in children. Nitrosamines are byproducts of nitrates found in cured and smoked meats, also a common contaminant in drinking water through agricultural runoff from nitrogen fertilizers. Food additives and chemicals are linked to type 1 diabetics because they generate free radicals which damage the insulin producing cells of the pancreas (beta cells), destroying cellular components. Improper balance of gut flora which plays a major role in our immune system. Avoidance of food allergies. Early signs of immune system response may be chronic ear infections, asthma and eczema. The most common allergens are dairy products, wheat, corn, citrus, peanuts, eggs, soy and foods containing artificial colouring. Deficiencies of vitamin D and essential fatty acids contribute to type 1 diabetes. Fish oils offer significant protection against the onset of diabetes because of its high vitamin D content. Studies reveal children who regularly took cod liver oil had an eighty percent reduced risk of developing type 1 diabetes while children with a vitamin D deficiency had a three hundred percent risk of developing the disease. Furthermore, women who consumed cod liver oil during pregnancy greatly reduced the incidence of type 1 diabetes in their children. Omega-3 fatty acids found in fish oils have an equally protective value necessary for healthy cell membranes. She teaches patients how to normalize and maintain their blood sugar levels naturally. No matter how bad the condition, natural medicine can assist a diabetics current state of health. There are many phyto chemicals which lower and maintain blood sugar levels. She addresses all of the side effects of diabetes such as retinopathy and circulation problems. Nutrition is still a focus especially when an individual is resuming a normal lifestyle as their sugar levels return to normal. Natural supplements can also accompany the dietary regime depending on the severity of the illness. Natural medicine can not only maintain sugar levels but also helps weight loss and sugar cravings. Iridology is a science performed by analyzing the iris (coloured portion of the eye), that surrounds the pupil. The iris is the most complex external structure of the human anatomy, connected to every organ and tissue in the body, via the brain and nervous system. There are specific markings in the iris, symbolizing pancreatic insufficiency, which are inherited showing potential for diabetes long before a blood test reveals the onset of the disease. Organs and glands such as the liver, gallbladder, thyroid, kidney and adrenals when insufficient, play a role in the disturbance of glycogen. Iridology enables us to look ahead and catch a glimpse of what might be. Looking at the iris gives us direction, for implementing lifestyle changes before problems occur. Prevention is our most discerning form of health care. Unfortunately, in today’s society, we are overfed and undernourished. Irregardless of our life’s priorities, we can help ourselves by helping our bodies strengthen our inherited weaknesses, through good nutrition, exercise and healthy attitudes.